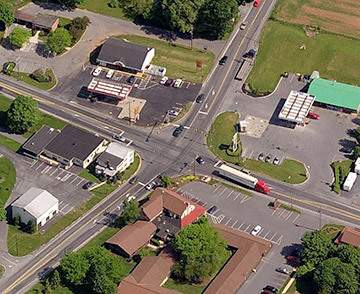 Hanover Engineering was retained by Elizabeth Township to assist in designing improvements and safety upgrades to the traffic signal at the intersection of PA Routes 501 and 322. The existing signalized intersection consisted of dual lane approaches with no vehicle detection equipment. Traffic studies determined that advanced, protected left-turn movements were warranted on all four approaches of the intersection. In addition to the upgrade for vehicle detection and the protected left-turn movements, the signal was updated with LED indicators, pedestrian signals, and alternate power supplies provided due to the area being prone to power outages. Prior to the traffic signal work being undertaken, additional geometric roadway improvements and safety features were required to be completed. These additional improvements resulted in the roadway needing to be moved closer to the building located at the southwest corner of the intersection. For safety purposes, a truck barrier curbing was designed as an added measure of protection for the building, its occupants, and pedestrian traffic in the vicinity of the intersection. For this project Hanover Engineering was specifically responsible for the design of the traffic signal improvements, including the design and preparation of traffic signal permit plans and preparation of the bid specifications. Hanover Engineering also assisted the Township in the bidding and award of the project, and provided contract management and construction observation during the course of the project.